After receiving a rather strange key with a hidden message, Shazia gets carried away by a mysterious man to a forbidden land. 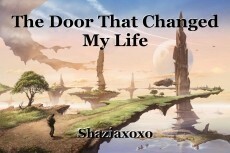 A strange door leads to a new magical world, with happiness. Unfortunately that's not the case. There is a new magical world, but it's not right to judge a book by its cover. Battling through a war, figuring out mysteries, and with a new lover on her way, will Shazia make it? It all started when I woke up Monday morning to drive to school. After getting my driver’s license at the age of seventeen, I found it extremely useful to not wake up my mom and have to listen to her dreadful attitude first thing in the morning. Anyway, I got out of bed, opened my curtains to welcome the sun into my room, and turned to my wardrobe to get ready for the day ahead. I rushed out of the house with an apple in my hand and my bag pack strapped onto my left shoulder. Feeling the usual morning breeze, I slammed open the car’s front door and sat myself down onto the cold leather seat. Suddenly I froze; I just remembered that I had forgotten my English essay on my study desk, which was in my room. I sprinted up the stairs to my room. And that is when I saw it, I twisted the doorknob, enabling the door to creak open. As the door was ajar, I spotted a glistening object on the edge of my bed, just staring at me. It was small, yet in a weird shape. I hesitated at first, but after pushing the door hard enough for me to walk in; I ran to my bed and grabbed the unknown object. What was it? Could it be harmful? Could it be a prank? Questions would keep hitting my head like a hammer would against a nail. I slowly tore of the shiny metallic wrapping paper, to find something that would definitely take a sharp turn in my life. The object was in fact, an antique key, decorated with three ruby stones on the stem of it. It was a little bit too heavy for a key and a little bit too scary as well. Why would anyone give me a key with no path to the door? But I was wrong because inside the wrapping paper was a tiny note, folded so small that it nearly sized smaller than my thumb. This was getting too creepy for my liking. I unfolded the tiny note, and was mesmerized by the beautiful calligraphy font on it. The following morning, I had no idea where I was. It seemed as if I was standing on an open field. It looked very much like the countryside but the only problem was that it wasn’t. It had four walls around it, making me feel like I was Thomas, from the Maze Runner. They were trees, and grass, and a little sleeping station. I rushed to the sleeping station because I needed to find supplies and hints if they were any other source of life in this cage. Fortunately they were clues scattered across the room. I was definitely not the first one here, because they were notes, food, torches, and many more hints of human life. I needed to find this person. I needed answers right now. I rushed outside out of the abandoned shelter, and made my way to the middle of the field in order to scan the area all at once. I squinted my eyes and took in my surroundings; four walls keeping me hostage like I was some object, and a group of trees that had bold green leaves. The leaves appeared to be too green to be real. They had different shades of green, the boldest being neon. To my right was a giant stand made of bamboo and rope, at the top was what had surprised me. It was a bucket. Just an ordinary bucket banded together with the old bamboo. I decided to check it out later, even if the time wouldn’t show. Suddenly, I head a rustle in a bush attached to one of the walls. I took a step closer, trying to discover what the mysterious sound was. I heard it again, and again, by this time I was merely a meter away from the bush. Almost immediately after I took another step, the rustling came to a halt. I stretched my neck and tried to look inside, for all I knew, it could be a bunny. But I was wrong. It came out and met my eyes. It was something I have never seen before, a crossbreed between a snake and a…. scorpion. It was intriguing yet revolting. Its eyes were focused on me, probably wondering when to attack, and so it did. I spotted a sharp branch on the side and picked it up. I swung right to left, and then left to right until I chopped its head off. I gasped at the crimson ooze pouring out of the beast. Suddenly, I narrowed my eyes and spotted a tiny door on the old grey wall. Freedom, I thought to myself. Maybe the man or women who were here escaped through that door too, so taking a risk, I slowly turned the knob. Hearing the creak of the door made me flinch but that didn’t stop me from succeeding my actions. I pushed the door till it was ajar, and pushed it harder for me to fit in onto the other side. Opening my eyes, I almost fainted at the sight that lay before me. It was a new place, a new life, and a whole new world. It was hard to describe, although I could name a few minor things like how they were rivers, townspeople, trees, houses, mystical creatures and- yes. Mystical creatures like Dragons, and Phoenix’s. This place was magical, but had me thinking…is this real? I pinched myself twice just to make sure I wasn’t dreaming. Out of nowhere, a girl, about my age along with her friend appeared. One was tall and thin; she had cocoa brown hair, along with a caramel skin tone. The other was not too tall and not too short; she had black hair that was so dark that it made me shiver. She had pale skin and narrow eyes. They were both really pretty. But why were they by me? “Hey, my name is Merlyn Jovita, but just call me Merlyn because I am a wizard anyway.” The tall one said as she sent me her hand to shake. In respond to her politeness, I shook her hand back. “My name is Yuehe Cea Pan. No I am NOT peter pan’s sister; I am Merlyn’s apprentice and right hand. What’s your name?” She asked. They seemed hospitable so I answered. “A door? About this tall, this wide and looks like your Grandma’s old cupboard? Yes. We know. You’re Welcome.” Merlyn exclaimed giving in a little bow. I laughed at her remark about the Grandma’s cupboard and when I looked at Yuehe, she just pointed out that Merlyn was crazy. They seemed pretty funny and kind so I followed them. After listening to them, they wanted to answer my questions. So we agreed to get firewood to build a fire, as it was getting quite frosty in this new world. I was on my own now gathering firewood, but I could still hear the distant sounds of the town’s music and people dancing and laughing. Suddenly, everything came to a halt. The music, the dancing, the singing, were all quiet. I turned around, almost tripping back when an old lady appeared right in front of my face. “Who-who are you? Why is everything quiet?” I stuttered, feeling absolutely frightened. “Dear child, you’re so lost.” Her voice was almost hypnotizing, so soft and smooth. “What? Slow down, what is going to change?” I asked, feeling my stomach twisting around almost a million times. She tucked a piece of my hair behind my ear and gave me a pitiful smile. “You didn’t think the adventure just ended, did you?” And before I could reply, she vanished into thin air. © Copyright 2019 Shaziaxoxo. All rights reserved.